Attackedastoria Nails: As the world falls down..
My favorite movie of all time is, hands down, Labyrinth. David Bowie's package in tighty-tights and overabundant glitter? Come on, who doesn't love this movie. I tried to do some Labyrinth-inspired nails, and this was the result. I was overall pretty happy with them, except the peach/crystal ball nail. 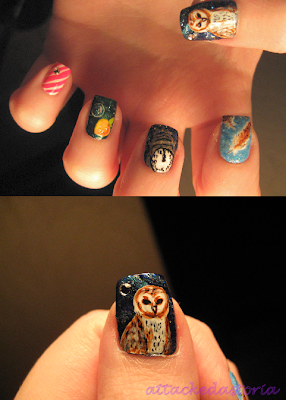 My favorite is the owl/feather one. When I was done, I thought they needed a little something, so I dug around and found some leftover jewels from when I did my nails for prom in like.. 2005. I tossed them on since I they reminded my of Jareth's crystal balls, and surprisingly, they stayed on for like a week and didn't chip.